Home Loo's Hair and Body Countdown to MBL ... Let's Grow! Countdown to MBL ... Let's Grow! A new series documenting my journey to longer, healthier hair. It'll take coconut oil, twists, low manipulation, and internal health to get there! I've got 30 weeks. I'm wrapping up week #1 of a new set of twists. The other night, I did my usual wash routine and airdried overnight. Yesterday I redid the perimeter of my twists. The twist challenge started on Tuesday. My goal for the end of the challenge (December 22) is to grow and retain two inches of hair. I'm starting slow on the green smoothie challenge but I'll fix that. I made a couple banana blueberry smoothies without the green. (The full recipe can be found here.) This weekend, I'll get down to the "real" green smoothies by adding spinach, kale, basil, etc. **The style above is a twist fishtail with a twistout pompadour on my hair. 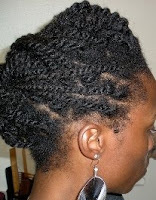 To create the pompadour, I undid about five twists in the front and pinned down the resulting twistout. The fishtail is simply a french braid created by overbraiding (not underbraiding) and tucking the end under. 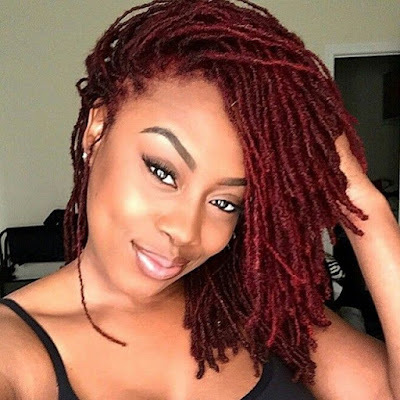 The funky look is great for a night out without having to take down all the twists. When I'm done with the look, I just retwist those five sections in front. Great! I admire the whole retwisting. I'm trying to go a whole month without doing so hoping that my hair don't loc... then again is that impossible when I wash every week focusing on my scalp? I'm trying the castor oil on scalp challenge. hennaing at the end of the months while in twist so I could refresh for the next month. Like the style. Even more inspired to grow back my strands and leave the scissor alone. Those green smoothies challenge is interesting I just wonder if I could drink it lol. Thanks. Yep, I've recently let go of retwisting weekly. Now I retwist every 3-4 weeks and just touch up the edges weekly. I hear you on the locking. I've heard from some naturals who are able to wash weekly without their hair locking. You may be able to do so too? I'll find out soon whether I can. Yep, get on that coconut oil prepoo! The green smoothies (depending on which ones you make) are pretty tasty. If it weren't for Lina (you can find her on fotki), I would've never experimented with them. Give them a try! I'm not sure as its my first time trying the whole month thing. frizz hair is not the business and i'm happy to say i stop stressing it. Yes I sure will try it. excited about it too. Okay for your smoothies are you adding spinach, kale and basil to one smoothie or one green veggie per smoothie? I'll be following you on your challenge, I'm currently in a protective style challenge indefinitely. This is the best time of year to do a protective/low manipulation challenge cuz the weather is changing(getting cooler for most) and I don't know about you but I don't feel like doing my hair much in the winter. LOL .. I hear you. No, I don't add them all into one smoothie. There's one recipe I found where I can add bananas, blueberries, and kale. Then there's another where I can add bananas, papaya, and spinach. Lina40 (on fotki) has some really cool green smoothies in her albums with cucumbers in one and celery in another. You can add as little or as much green as you want. Yay on joining the challange. Yep, you're right ... this is the best time of year to protect the hair. LOL ... I don't feel like doing my hair much either. Thank goodness for twists!